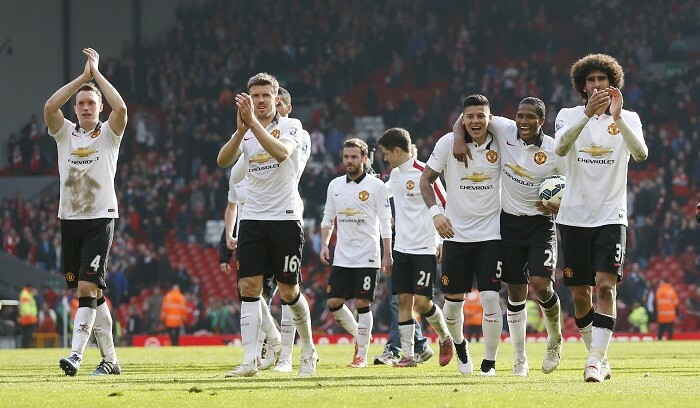 In the race for a top four finish, Manchester United defeated Aston Villa by 3 - 1 on Saturday. Manchester United claimed three important points on Saturday after defeating Aston Villa 3 -1. With this win, they also jumped up to the third spot in the league table ahead of Manchester City, reported the official website of Manchester United. Ander Herrera was the star of the match as he netted a couple of goals past the Villa defense and Rooney too scored a screamer from Angel Di Maria's cross in the second half of the game. Herrera gave United the lead just ahead of the half time whistle with a sumptuous finish from Daley Blind's beautifully crafted pass from the left flank. Rooney volleyed past the Villa goalkeeper in the 79th minute and Benteke replied within 90 seconds and scored past David De Gea, who was a mere spectator throughout the game at the other end. Herrera scored yet again in the additional time taking his goal tally to two in the match and helping The Red Devils secure three crucial points ahead of next Sunday's clash against the arch rivals Manchester City. United boss, Louis van Gaal expressed his happiness after the match. He said in the post match interview, "I am very pleased that we scored three goals because that's not so easy against this defensive organisation. But as a manager you always want more, that we play with a higher ball tempo, but okay, I am very happy with the victory." He also went on to laud Herrera and his performance, "He has a very good kicking technique and he should only be more composed." He told Herrera, "You have to control the ball before you shoot". He further added, "I said that to him again in yesterday's training session, and then I kissed him at half-time because he had controlled the ball for the first time in his life and then he shot."